Beef brisket cooked for 10 hours, seasoned with black pepper. Ready to eat in 30 minutes. Serves 2. 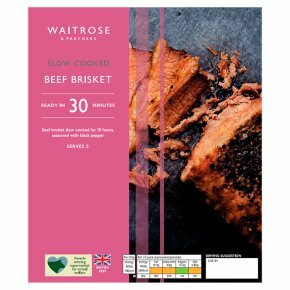 Our beef brisket has been slow cooked for 10 hours for you, so the meat is succulent and tender; all you have to do is finish in the oven for 30 mins. Our beef is expertly prepared and matured for tenderness and flavour, our prime cattle are reared on a forage based diet on carefully selected British farms. INGREDIENTS: Beef brisket (95%), water, black pepper, salt.